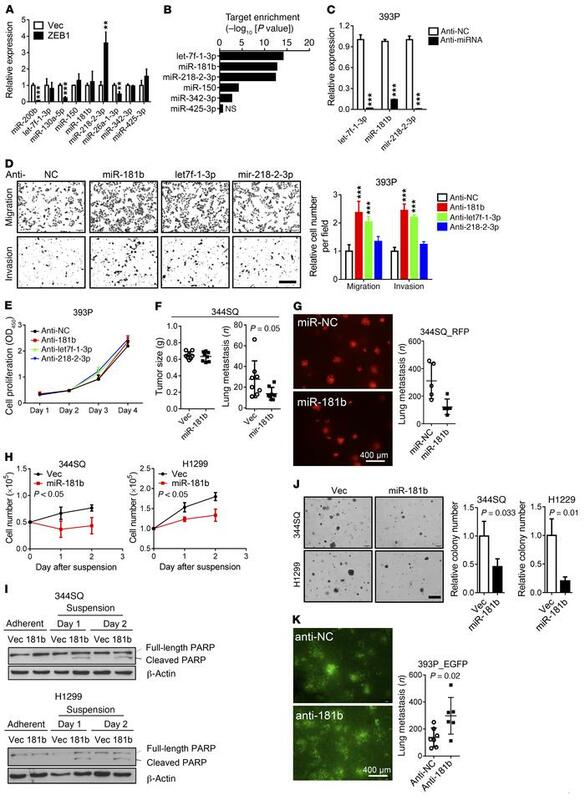 miRs not repressed by ZEB1 have metastasis suppressor activity. (A) Quantitative reverse transcription PCR (qPCR) analysis of miRs in 393P_ZEB1 cells (ZEB1) and 393P_vector cells (Vec). Results expressed relative to 393P_vector cells. miR-200b included as positive control. (B) Enrichment of ZEB1-upregulated genes in miR targets as assessed by a hypergeometric test. (C) qPCR assays quantify antagomir-mediated depletion of miRs in 393P cells. Results expressed relative to control antagomirs (anti-NC). (D) Boyden chamber assays on antagomir- and control-transfected cells. Migratory and invasive cells were photographed (images) and counted (bar graph). Scale bar: 200 μm. (E) Relative densities of transfectants on plastic. (F) Primary tumor weights (left) and numbers of lung metastases (right) in mice injected subcutaneously with 344SQ cells that express ectopic miR-181b or vector (Vec). (G) Fluorescence microscopic images of lung metastases in mice injected by tail vein with red fluorescent protein–labeled (RFP-labeled) 344SQ cells transfected with miR-181b or control mimics. Scatter plot: numbers of lung metastases per mouse (dots). (H) Numbers of viable 344SQ and H1299 transfectants on low-adhesion plates. n = 4. (I) Western analysis detects cleaved PARP as a marker of apoptosis in transfectants on adhesive or low-adhesion (suspension) plates. β-Actin is loading control. (J) Soft agar colony formation by miR-181b and vector control (Vec) transfectants. Colonies were photographed (images) and counted (bar graphs). Scale bar: 100 μm. Results expressed relative to vector controls. (K) Fluorescence microscopic images of lung metastases in mice injected by tail vein with green fluorescent protein–labeled (GFP-labeled) 393P cells transfected with anti-181b or anti-NC. Scatter plot: numbers of lung metastases per mouse (dots). Values are mean ± SD. n = 3, unless otherwise indicated. P values, 2-tailed Student’s t test and Dunnett’s test for 2-group comparisons and comparisons of more than 2 groups, respectively. Results were replicated (n ≥ 2 experiments). **P < 0.01 and ***P < 0.001.